A character drama, Rampart goes for oodles of style but is fundamentally lacking in meaningful substance. It's 1999 in Los Angeles, and the police department is rocked by the corruption scandal named after the tough Rampart division. Veteran Officer Dave Brown (Woody Harrelson) carries a dirty reputation and emotional scars from the Vietnam War, patrolling the streets with an eye for brutality. Brown is barely on speaking terms with his two ex-wives (who are also sisters) Barbara and Catherine (Cynthia Nixon and Anne Heche). He is also detached from the lives of his two daughters, brooding teenager Helen (Brie Larson) and the younger Sarah. Brown roughs up a detainee and is caught on camera bludgeoning another man. He is hauled in front of disciplinary committees while Assistant District Attorney Joan Confrey (Sigourney Weaver) urges him to retire. Brown starts an affair with lawyer Linda (Robin Wright), although he is suspicious of her motives. Meanwhile retired cop Hartshorn (Ned Beatty) is sympathetic and warns Brown that he is being used as a distraction. Directed by Oren Moverman who also co-wrote the script with James Ellroy, Rampart is caught in no-man's land. With a barely-there story, an unexplained context and wafer-thin characterizations, the film spends most of its time in close-up, observing Brown's mannerisms as he cruises the streets and lights up cigarettes. While Woody Harrelson buys fully into the role, he has precious little to work with. Officer Brown is certainly not likable and neither is he magnetic or interesting. He is simply a disturbed thug, doing just enough to ensure the system will struggle to fire him. The post Vietnam War trauma excuse floats in and out of the film in a couple of references, and otherwise Brown is left exposed on-screen, unable to generate any reason why anyone would care about him. Elsewhere plenty of people populate Dave Brown's universe, with a strong cast ready to bring them to life, and they are all shortchanged. Two ex-wives who are sisters may be an interesting twist, but not when they are both ill-defined. A dark affair with a seemingly troubled slick lawyer slumming it in Brown's universe offers intriguing opportunities, but Moverman and Ellroy do not appear to know what to do with the subplot. Ned Beatty's Hartshorn shows up intermittently hinting at dirty conspiracies, and these are perhaps better explained in other movies. 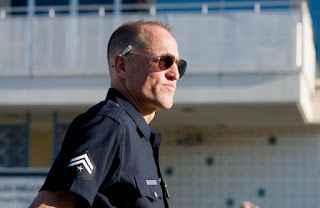 Ben Foster as a wheelchair-bound but rather ghostly presence shares some sit-still-and-stare moments with Harrelson, and Ice Cube pops up late as an Internal Affairs officer. Steve Buscemi and Jon Bernthal appear in brief scenes. Rampart vaguely hints at attempts to echo the street-level grittiness of Training Day but in the end falls well short. This cop drama is absent both the compelling cop and the essential drama.